Kauffman began working in golf as an outside service representative at Everett G&CC in 1985. 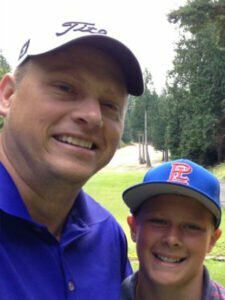 After attending college at San Jose State University, he began his professional career at Lynnwood Municipal GC in 1992. It was while attending college and working at Sunol Valley GC that Kauffman was inspired to become a golf professional. “I was working behind the counter as a shop assistant. Since the golf course was 36 holes and had a huge three-story clubhouse, the place felt like it was its own facility and I absolutely loved it,” said Kauffman. Kauffman’s enthusiasm continues to this day, and his members love him right back. “The members here at Bear Creek are all incredibly appreciative to anyone that has their interests in mind, which I do, so life with them has been very enjoyable,” said Kauffman. All of the golf pros listed above are all known for OUTSTANDING customer service, so if you have a chance to work with any of these professionals, just pay attention to what they are doing and how they conduct themselves when interacting with the members. Make sure you do the things well that you ARE expected to do and do some things you aren’t expected to do. Take a big pot of coffee out on a ranger run with you for the guys, take lemonade and ice tea out to the ladies. Member golf trips are no-brainers (make SURE you take the ladies on trips too – not just men’s trips!). Go to as many functions as you can. Basically, show the members that you are truly vested in making sure they are enjoying their time at the club. “Here at Bear Creek CC, we not only have a great layout, but a great Head Golf Professional,” said JD Cline. Thank you for nominating a fantastic golf professional, JD!